“Greater Boston,” Boston’s popular WGBH (public television) news program, recently invited me on the air to discuss Unhinged. You can see the clip of my interview with host Emily Rooney below. 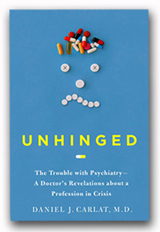 Unhinged by Daniel Carlat, M.D.